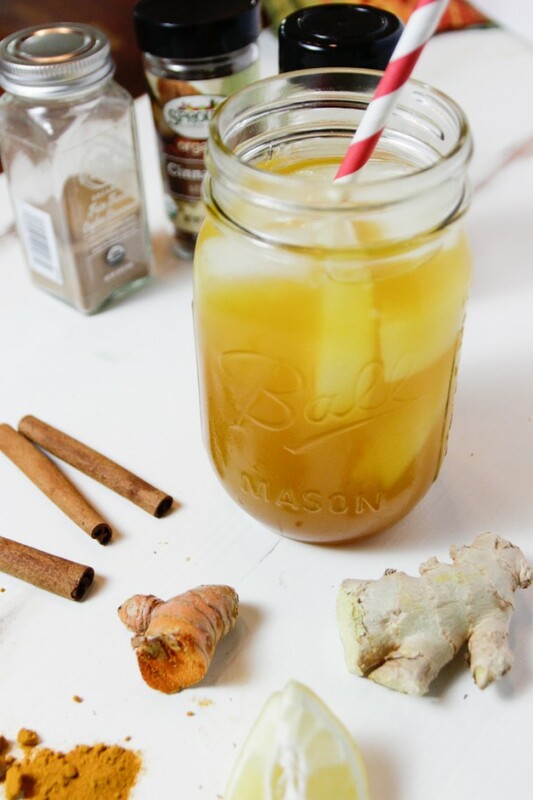 I absolutely love this Turmeric Ginger Iced Tea Recipe. It’s a refreshing, anti-inflammatory, soothing on the digestive system, cleansing and energizing tonic. Most iced tea recipes use lots and lots of sugar. This variation I make is sweetened with maple syrup, which keeps it refined sugar-free, and adds a nice punch of digestive soothing properties, vitamins, and minerals. I also love getting creative and using different fruits and herbs as new fun variations. Sometimes adding some citrus, sometimes making a hibiscus lime variation. I also love throwing nubs of fresh ginger and turmeric in my daily smoothies. Not only is this iced tea refreshing, it's also loaded with anti-inflammatory roots, turmeric, and ginger. Fresh turmeric can be a little hard to find, although my local Whole Foods has it. It's very similar looking to fresh ginger, except a lovely orange color and is much milder in flavor. This turmeric ginger iced tea is a refreshing way to get your get your body energized, soothed, and cleansed. Perfect summer picnic recipe or warm during a cold winter day! Place water in a saucepan and heat over medium. Add the turmeric root, ginger, ground cinnamon and maple syrup. Strain and serve over ice with a slice of lemon. 0 Response to "Turmeric Ginger Iced Tea"